“The violence of Boko Haram has now been added to by that of the Fulani herdsmen. While so-called Islamic State has been losing ground in Iraq and Syria, Nigeria is today the country recording the highest levels of Islamist terrorist activity in the world. Our country is, so to speak, the future “hope” of the Islamist fundamentalists.” This was the view expressed by Father Joseph Bature Fidelis, from the diocese of Maiduguri in northeast Nigeria, at a meeting organised by ACN with members of the European diplomatic corps at the Holy See. 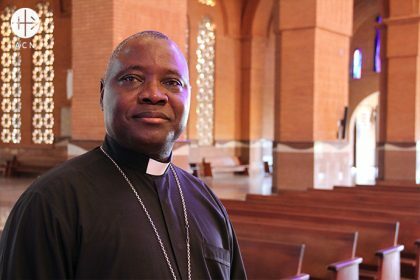 The reports reaching the international Catholic pastoral charity ACN International from this African country in recent days are dramatic indeed. Since the beginning of February, in the state of Kaduna alone, more than 130 people – mainly from the Adara tribe – have reportedly been murdered by Islamist herdsmen of the Fulani tribe. A veritable wave of violence has left over 10,000 people homeless and caused the destruction of some 150 homes. 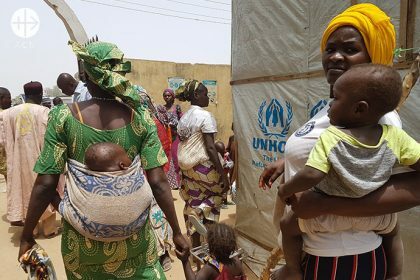 “These latest attacks have reduced many village communities to rubble and raised the level of the humanitarian crisis here to one of extreme gravity”, writes Father Williams Kaura Abba, of the diocese of Kaduna. Peaceful procession “Stop the Kajuru Massacre now”. People demonstrate against the killing in Southern Kaduna. 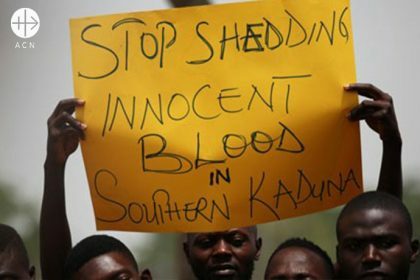 Men with handwritten posters demonstrate against the killing in Southern Kaduna. The first time Boko Haram came to our village, we were lucky. Just as we settled in for dinner, we heard their gunshots and ran to the mountains. For the two days we were there, our fear of death kept us alive. We returned to burned houses and churches, which led to a crisis between Christians and Muslims that was only stopped by military intervention. Less than a week later, Boko Haram struck again. They came at my family with a deadly mission. A million thoughts flooded my mind, but none overshadowed the thought of my children—Daniel and Salome—and getting them to safety. Refugee camp for christians, the center was the official representation place for the Christian Nigerian Assosiation (CNA), they gave the place for the refugees. There are 5000 IDP’s. But they beat me to it. When I reached where my children were hiding, I saw the insurgents holding them by their shoulders as they struggled helplessly. They were about five and seven years old then. The insurgents looked triumphant. My knees buckled, and my eyes filled with tears. I was afraid of what might happen to them, especially to my daughter. Then, one of the insurgents savagely dragged me, so I could witness my husband’s death. They butchered my husband mercilessly, and they made sure that I saw it all. I can’t forget the fear in his eyes. I don’t want to say more than this. I hate to remember. Meanwhile, my children were taken away. My maternal instincts were charged up. They had taken away my husband; I would not let them take the fruits of our love, too. I’d be dead without them. But the journey was too risky to make then, and I ended up in Yola, the state capital, for six months, with haunting visions of my children’s struggles. Around May of 2014, I heard that the soldiers had recaptured Gworza. I went to look for my children, but I couldn’t get a vehicle to take me to Ngoshe, where I was told they were. So I trekked for a day. On the way, I saw soldiers and Boko Haram clash, which was no worse than what I’d already seen. I simply avoided them and took the ‘safe’ paths. I was captured when I reached Ngoshe. The capture pleased me, because in a way, I felt closer to my children. My mother-in-law was the first person I saw. As she excitedly screamed, my children showed up from behind her. I don’t think I can describe the joy I felt. Only God knows the depth of my gratitude. This was the first time in my life I consciously recognized God’s presence. But now, as we speak, I realize that he has always been there. I was happy that my mother-in-law didn’t ask me about her son. I don’t know how I would have told her about what happened. My children, while in captivity, were Islamized and renamed. Daniel became Musa; Salome became Yagana. After three days of planning, my attempt to escape failed. My children were taken away, and I was brought to a detention camp. For two weeks, my hands were bound behind my neck, and my feet were tied together. I was tortured with all sorts of objects, and they didn’t stop until they drew blood. They beat me very badly, but I kept my faith. When my detention mate died, I prayed fearfully in my language. It turned out that a guard spoke that same language; he was from my tribe; eventually, at his urging, I was freed after three months from the detention camp and let back into the larger camp. Bishop Oliver Dashe Doeme of Maiduguri, Nigeria. My mother-in-law nursed me back to health. It’s been four years since my release, and I still don’t have the full use of my hands. Since I came here, the Church has helped me in my treatment. I was brought to St. Patrick’s Cathedral from Maiduguri Specialist Hospital, and a cathedral administrator took me to the private hospital, where I underwent physiotherapy for six months. After three years, on March 2, 2017, I was reunited with my children in Maiduguri. After a clash with Boko Haram in Ngoshe, the soldiers had rescued them. Now that I am back with my children and mother-in-law, my joy knows no bounds. But my husband’s death—having to watch it—will haunt me forever. In 2017, Aid to the Church in Need visited the Diocese of Maiduguri and met Catherine and many other widows and orphans victims of the atrocities of Boko Haram. The foundation supported the pastoral work of the Church in Nigeria with projects totaling more than $1.6M in 2017. These included support for the care widows and orphans, victims of Boko Haram, as well the reconstruction of the cathedral and the minor seminary in the Diocese of Maiduguri, destroyed by the terrorists. Today, 19th February 2019 marks exactly one year since the abduction of 15-year old Leah Sharibu, one of the school girls taken hostage by Boko Haram Terrorists from Dapchi in Maiduguri, North East Nigeria. Leah Sharibu is a 15-year old Nigerian girl. She was abducted when Boko Haram stormed a boarding school in the town of Dapchi, Diocese of Maiduguri in north-eastern Nigeria on 19th February 2018 kidnapping 110 school girls. Also speaking, Leah’s Father, Nathan Sharibu sighed, “We will not give up. We are strong in Christ” and agreeing with him, her mother Rebecca Sharibu added, “God is able to keep us and bring Leah back, so to give up is not an option”. Reverend Para-Mallam described Leah as the heroine of the Christian faith in the 21st Century, an icon of the Christian faith for the younger generation and a symbol of faith resilience emerging from North Eastern Nigeria- a people who have suffered persecution for so long. “God is making a powerful statement through the captivity and courage of Leah Sharibu. Christianity can never be destroyed by Boko Haram or any force on earth: spiritual or physical – temporal or long-term”, the evangelical pastor said. 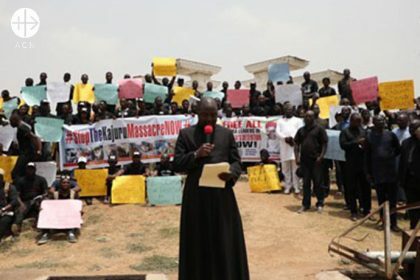 “The God of justice reigns”, he emphasized, “ Boko Haram will not escape God’s divine justice and intervention on Leah’s behalf and others in captivity”. Rev. Para-Mallam prayed for the release of not only Leah but through her, other several unknown captives – Muslims and Christians alike – who are being held captive by the deadly terrorist group, Boko Haram. “My appeal and question to Boko Haram is – Where is your humanity? Imagine if Leah were your daughter, would you like what you are doing to her? Against her will and consent? God never forces any one to convert!”, he said. Nigerians will be going to the polls on 16th February and 2nd March 2019 to elect a President, Federal Parliament and other representatives. Parts of the Country have continued to experience violence from the Muslim extremist groups such as Boko Haram. 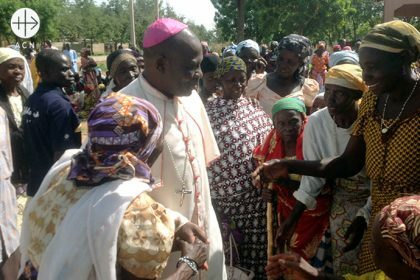 Aid to the Church in Need spoke with Mgr Ignatius Ayau Kaigama, Catholic Archbishop of Jos regarding the current situation, the forthcoming general elections in Nigeria and his hopes for the country. While a few political rallies have already recorded a few accidental deaths and the disruption of peace, we must commend the campaigns of most of the parties that have carried out their activities peacefully. There is however a general tension and apprehension as to what may be the likely reactions of those who already feel that there might be manipulations of the elections. Mgr.Ignatius Kaigama, Archbishop from Jos (Nigeria) and President of Conference Episcopal from Nigeria. 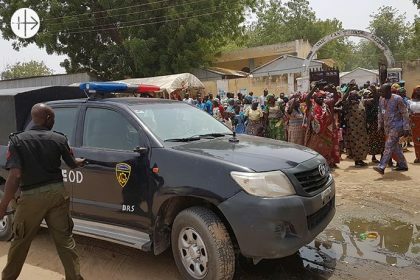 Attacks by Boko Haram have surprisingly intensified in the last couple of days in areas like Michika, Shuwa, Madagali, Mubi, – in Borno and Adamawa States. Some people say that the renewed attacks are politically motivated or sponsored to score political points or may be an attempt to disenfranchise some of the electorate during the elections. It is clear however that Boko Haram wants to make a statement that it has not been defeated. The threat by Boko Haram is still real. They are far from being defeated. Mgr Kaigama: I should be concerned. When peace is disrupted, Catholic religious leaders like me suffer more than those elected into government because people flock to our houses and offices knowing that there are no gun-wielding police or soldiers to scare them off or police dogs to sniff and bark at them when they come to ask for help for the basic things of life. We have to manage to assist those who are displaced and without means of livelihood. Because of how overstressed and overwhelmed we religious leaders become when there are crises, we pray and work very hard to proactively promote the culture of peace and we are making concerted efforts to ensure that we have free and fair elections which will culminate in peace for all. If the elections are marred by violence many innocent Nigerians will pay the prize. I hope for fair, peaceful and credible elections; for good, patriotic, selfless and God-fearing leaders to emerge, who will be more concerned about the masses rather than their personal ambition and luxury of office. Well-formed and qualified youths are on the streets in huge numbers without jobs. We hope that those aspiring to offices at all levels will consider the plight of the youth as a priority. 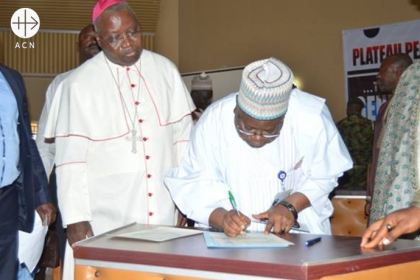 Archbishop Ignatius Kaigama is witnessing the signing of the document called “Plateau Peace Commitment in view of the 2019 general elections”. It was signed by the governourship Candidates in Plateau States and witnessed by traditional/religious heads, civil society groups, senior security personnel and various community stakeholders. Mgr Kaigama: As the Catholic Church in Nigeria does during every election, our Justice Development and Peace Commission (JDPC) is proactive and highly sensitive to the need for peaceful and fair elections. The JDPC has served creditably as election monitors/observers in the past, pointing out flaws, weaknesses and strengths witnessed. A statement has recently been issued by the Catholic Bishops’ Conference of Nigeria encouraging prayers, proper conduct of elections and correct attitudinal approach by citizens to the elections. The Church in the Archdiocese of Jos has been frantically multi-tasking as a way of contributing to the peaceful elections. We have cautioned our members to be law abiding, to go on peacefully and not to allow themselves to be used by selfish politicians. They must ensure that they possess their voters’ card and go out to vote. As priests, we encourage our people to be prayerful and alert during this season; we caution ourselves the clergy to remain non-partisan. Our Justice, Peace and Development Commission has in the past two years been running projects in target communities for peaceful elections. They have taught different communities what to ask for by training them on the ‘Charter of Demands’ when the politicians come looking for their votes. Our JDPC has organized trainings on peace-building and Alternatives to Violence Programmes (PB/AVP) in schools and communities. As part of the activities leading to the elections, our Dialogue Reconciliation and Peace (DREP) Centre recently organized a peace accord signing ceremony for all the governorship candidates in Plateau State, which was witnessed by traditional/religious heads, civil society groups, senior security personnel and various community stakeholders. Also, going into the elections, as a Church our JDPC is officially accredited as election observers. We are equally prepared to intervene and manage post-election violence should it occur. We pray it doesn’t. Mgr Kaigama: I am a strong optimist. I believe strongly that the best for Nigeria lies somewhere close by. I am deeply patriotic about my country Nigeria. There are so many negative things said about Nigeria but I believe that Nigeria with all her defects and imperfections will surprise the world one day, leaving those who ridicule and write her off spell-bound and flabbergasted. Nigerians are a peaceful, joyful, hardworking, religious and resilient people who are only unfortunate not to have selfless leaders with vision but leaders who take joy in pilfering the enormous wealth God has blessed us with. This, they do with the collaboration of some foreign countries, companies, organizations and individuals. Mgr. 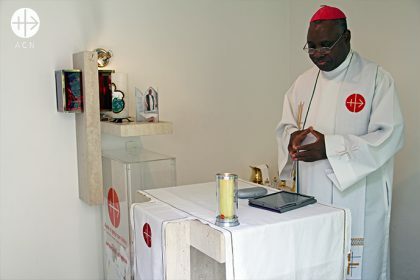 Ignatius Kaigama celebrates Mass at the brazilian ACN office. Mgr Kaigama: ACN can mobilize their world net-work of friends, benefactors and supporters to commit Nigeria to special prayers at this critical time of elections. We need support our various peace-building, awareness raising initiatives and various proactive programmes of peace education organized before, during and after elections. Furthermore support for training/empowerment programmes for our youth, teenage girls and widows is needed, to give them hope and to keep them out of trouble. Leah, 15 years old, was kidnapped along with 110 other students when Boko Haram stormed on February 19, 2018 in a boarding school in the city of Dapchi, in the diocese of Maiduguri in north-eastern Nigeria. A month later, some of the girls died in captivity and all the others were released, except Leah. 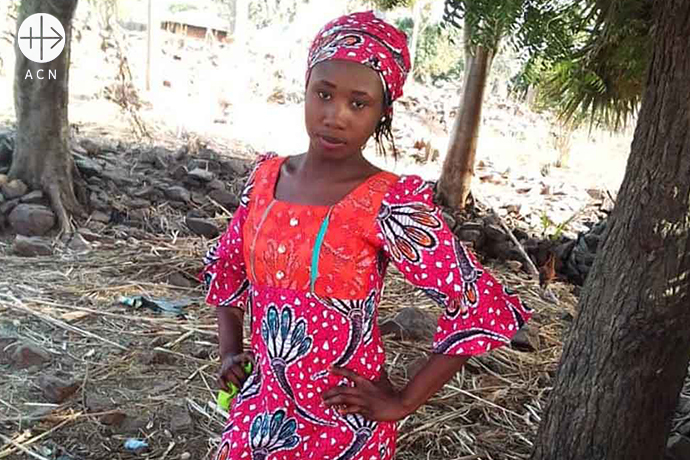 Leah Sharibu is a 15-year old Nigerian girl. She was abducted when Boko Haram stormed a boarding school in the town of Dapchi, Diocese of Maiduguri in north-eastern Nigeria on 19th February 2018. Those who were released declared that Leah was the only Christian of the group and the terrorists had forced her to convert to Islam, but she had refused. Leah’s mother, Rebekah, has asked for continued prayers for Leah: “I know that all over the world believers are praying and advocating for the release of my daughter, but until now I haven’t seen my Leah. I want to plead that Christians: do not get tired of praying for her till she returns”. Her refusal to apostatize from her faith in Christ has made an impact on her father Nathan who said: “My daughter’s trust and faith has made me realize that I have been living under the same roof with an admirable disciple of Christ, I am highly encouraged by her strong faith in the Lord and her refusal to renounce Christ even before death at the hands of Boko Haram”. In October, the terrorist group released a video threatening to keep Leah as a “slave for life”. 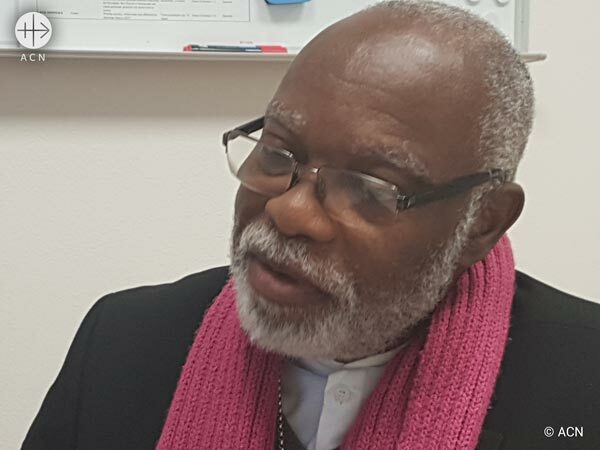 Bishop Ignatius Kaigama, Archbishop of Jos, has also added his voice to the request of Leah’s mother during his visit to Malta for the launch of the Report on Religious Freedom in November. It is estimated that more than 2,000 women, girls and young men remain in Boko Haram captivity. Captives are forced to convert, married off to militants and those who refuse, suffer extreme violence. In June 2018, Bishop Avenya had issued a desperate appeal to the international community, urging it “not to wait for a genocide to happen before intervening”. Additionally, on numerous occasions, the Nigerian bishops’ conference has called on the Nigerian President Muhammadu Buhari to provide effective guarantees for the safety of his people or, if he is unable to do so, to resign. Their petition has been ignored and the violence continues. Meanwhile, Muhammadu Buhari plans to stand once again for president in the new elections to be held in February.